W/C Praia do Camilo is a spectacular beach along the Algarve in Portugal. The Algarve is the southern most coast of Portugal. It varies from fine sandy beaches with magnificent rock formations to savage rugged beauty as you go north around Sagres. 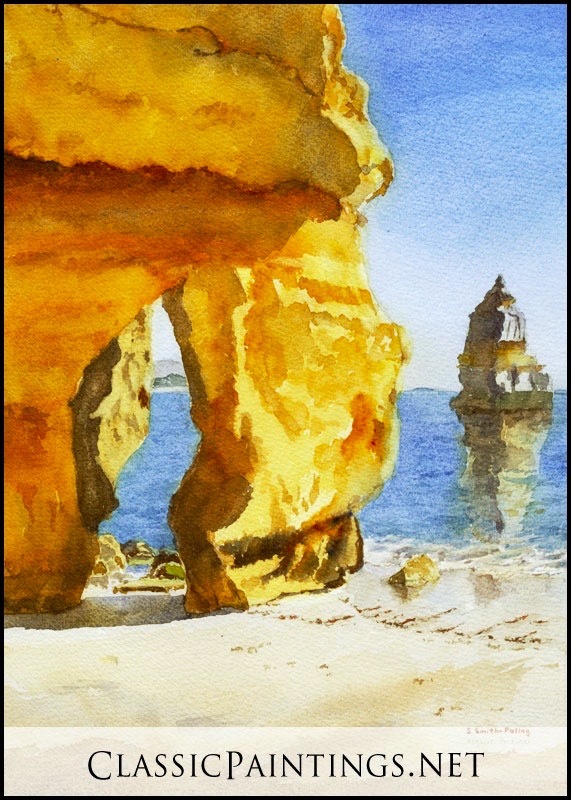 The rock formations against the incredible blue sky and water are truly fascinating and beg to be painted. 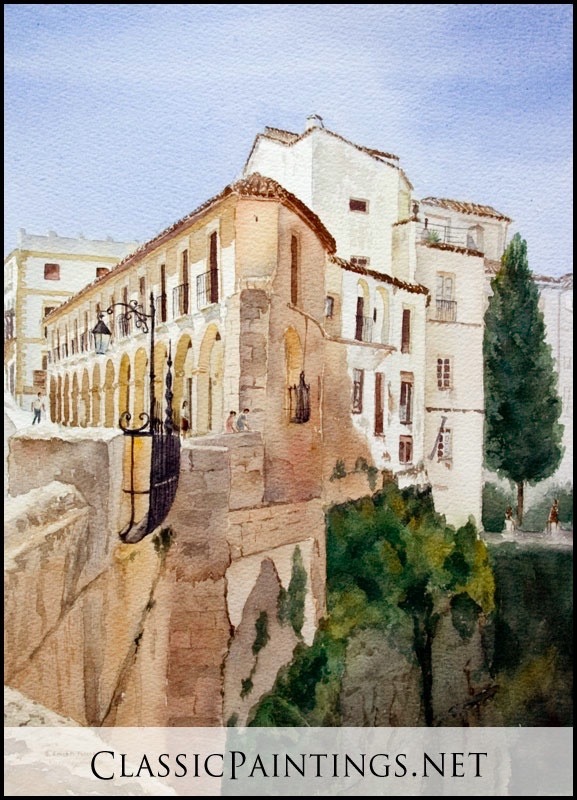 Artist note: I was deployed with the USAF as a flight surgeon, near Seville, Spain and had the luxury of two visits to this delightful area to make numerous sketches and paintings. The water was still a bit cold in Spring, although my husband took the plunge. W/C While visiting and painting in Ronda, I came across numerous Andalusian horses and riders and couldn’t resist painting them. 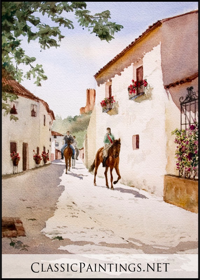 I spent many happy hours at the Spring Fair in Moron de la Frontera studying the beautiful Andalusian Horses. 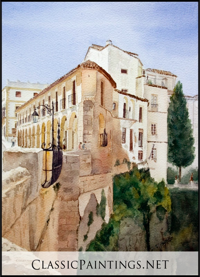 Ronda, Spain is situated in the far northwest of the province of Malaga. It sits on an outcrop of rock surrounded by mountain ranges and is of a height and length that make access difficult. It is one of the oldest towns in Spain and has its origins in prehistory. The cave of Pileta has the Andalusian Stone Age art are located near here. The town has a strong Moorish influence in its architecture, Arab baths, etc. It is well known for its banditry (its location made it near impenetrable) and bullfighting. Artist note: I was deployed with the USAF near here and had the luxury of frequently visiting this delightful town and making numerous sketches and paintings. W/C The town gained its name by being the frontier of Spain's 13th century battle with the Moors. There is local evidence that Stone Age cave-dwellers used rocks to form living chambers. Roman ruins also exist in the area. Arcos became an independent Moorish taifa in 1011 during the protracted collapse of the Umayyad Caliphate of Córdoba. The town was a bulwark of Christianity after Alfonso the Wise of Castile (1252-1284) expelled the Moors. He constructed a Gothic Cathedral which remains on its high ridge. It is famed for its ten bells, which tolled throughout the war with the Moors. Several Moorish banners were taken in the nearby battle of Zahara and have been on display in a church in Arcos since 483. This view from across the river is the most dramatic scene and remains the same for hundreds of years. Artist note: Artist note: I was deployed with the USAF at the Spanish Base Aero de Moron, near Seville. 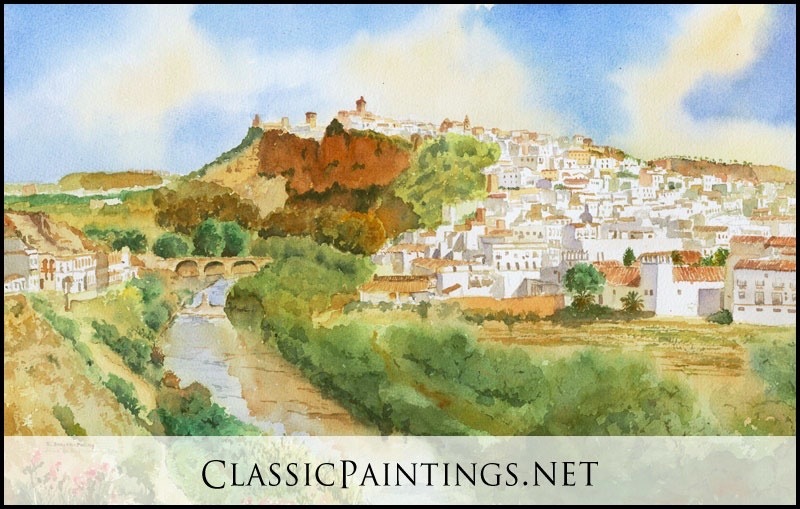 This provided a wonderful opportunity to paint in Spain, Portugal, Gibraltar and Morocco. W/C Cadiz, Spain is fascinating. It's the oldest city in Europe. Almost entirely surrounded by water, the city appears isolated. It stands on a peninsula jutting out into the bay, dramatically defining the surrounding landscape.This ancient city on the Costa de la Luz in Andalusia is approximately 3,000 years old. The Phoenicians, Carthaginians, and Romans have all settled there at one point over the years. Initially it was called Gadir by the Phoenicians. They were the first settlers, in 1100 BC. Next were the Carthaginians and then the Romans who turned it into a thriving port. 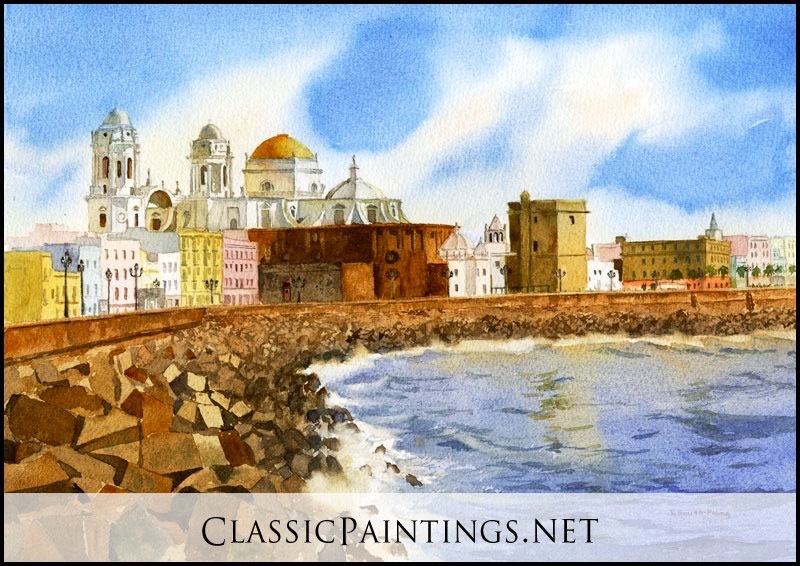 During the 17th century, trading between Cádiz and the rest of the world increased dramatically; the economy boomed. 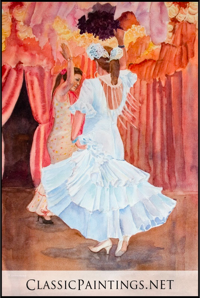 Cadiz (or little Havana) as it's often called, developed strong relations with Cuba. There has been a continuous flow of traffic between the two cites over the years. The two cities even look very similar. Cuban scenes from the James Bond film (Die another day) were shot in Cadiz. 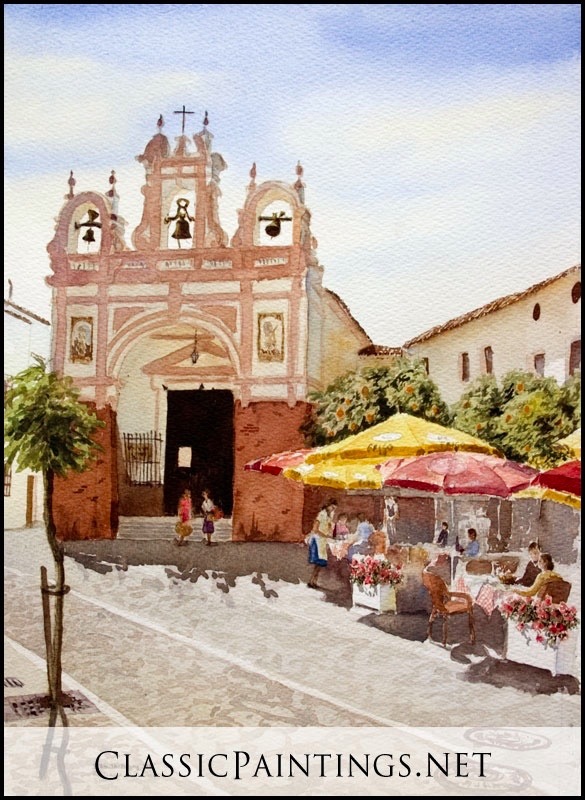 Artist note: I was deployed with the USAF at the Spanish Base aero de Moron, near here and had the luxury of frequently visiting this delightful area and making numerous sketches and paintings. W/C The beautiful West Coast of the Algarve with its dramatic cliffs and rock formations is still completely unspoilt and there are some fantastic beaches - famous for fishing and bird-watching - but usually unsignposted and hidden from the road by high sand dunes. CARRAPATEIRA - A drive through open countryside and woodland takes you to Carrapateira. Here on the west coast the villages shelter inland from the winter storms. It was along here on a wildlife refuge that we saw this fishing boat storage/launching site. It seems impossible that they would launch and recover their boats at this steep and rocky area. 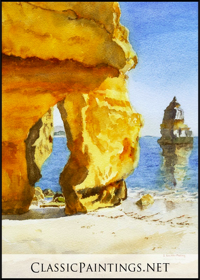 Artist note: While deployed with the USAF at the Spanish Base Aero de Moron, Spain, my husband and I were able to visit and paint in this wild, beautiful location in Portugal. 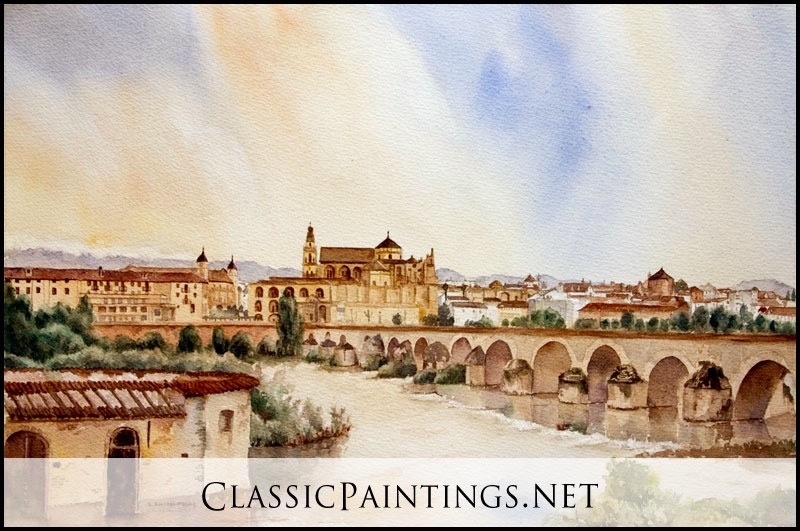 W/C Standing on the sweep of the Rio Guadalquivir provides a dramatic view of the old roman bridge and the skyline of Cordoba. The Roman colony of Corduba was founded in 152 BC, and became the capital of Baetica province that is most of Andalucia today. In 929 AD under the Islamic ruler Abd ar Rahman III it became independent of Baghdad and was the biggest city in Western Europe with a population between 100,000 to 500,000. An incredibly beautiful Mosque was build (Mezquita). Unfortunately, later in the center a Gothic Christian Cathedral was built and destroyed much of the light and beauty of the mosque. While station in Spain with the Air Force, I had the opportunity to visit and enjoy this beautiful city. This panorama of the city just begged me to paint, so I did! 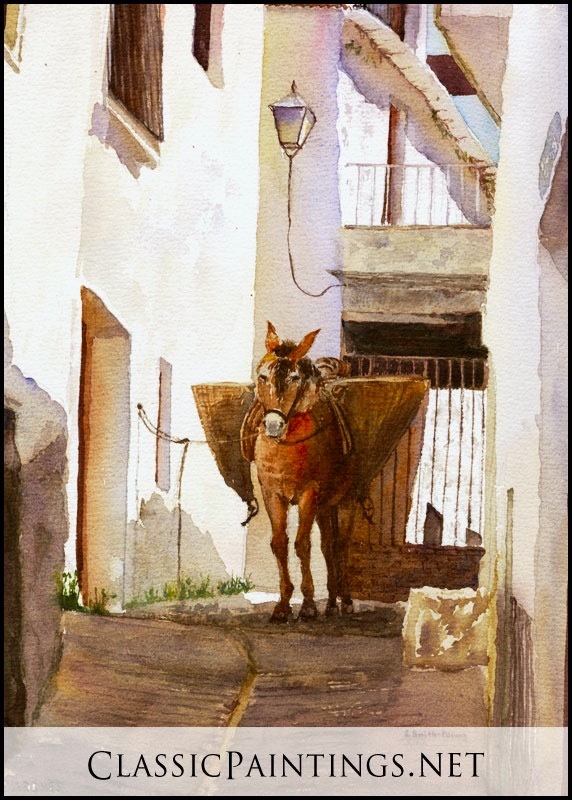 W/C While wondering the foot paths in Orgiva, in Granada Provence of Spain, I came upon this donkey patiently waiting for its master. We later saw the same donkey plodding up the hills. I heard they often carry hops or wood. *The region of mountain villages known as Las Alpujarras clings to the southern flanks of the Sierra Nevada, cloven by deep, sheltered valleys and gorges which run down towards the Mediterranean. 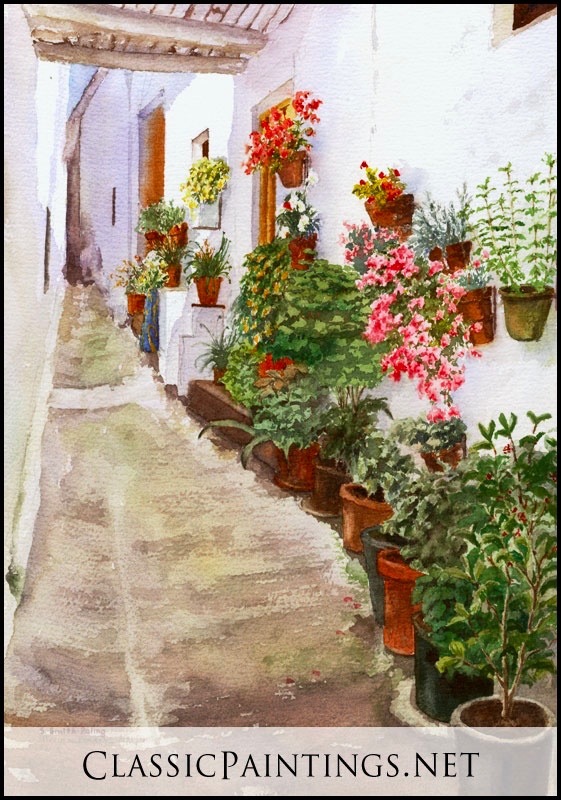 The Alpujarra, as it is popularly known, in the singular, is famous throughout Spain because of its unique mini-ecology. Its terraced farmlands are constantly watered by the melting snow from above, constituting a high-altitude oasis of greenery which stands in dramatic contrast to the arid foothills below. This is ideal hiking terrain for adventurous travellers, provided you take along a tent and well-padded sleeping bags - the average altitude is 4,000 feet above sea level. The cultural interest of the region lies in its fifty-odd villages, which were the last stronghold of the Spanish Muslims, or Moors. Soon after the Castillians took Granada in 1492, all the city´s Moors were forced to convert to Christianity. Those who refused took to the hills, settling in this remote, inaccessible area. Constant pressure from the Christians led to a bloody uprising, the Morisco Rebellion of 1568, which was ruthlessly crushed out, with the public execution of the leader, Ben Humeya, in the main square of Granada. Soon followed a royal decree expelling from the Kingdom of Granada all people of Arab descent, since the "new Christians", as the converts were called, were all suspected of being ¨crypto-Muslims¨ in secret... The villages of the Alpujarra were resettled with some 12,000 Christian families brought by King Philip II from Galicia and Asturias in north-western Spain. However, these unique hamlets have retained their traditional Berber architecture - terraced clusters of grey-white box-shaped houses with flat clay roofs - which is still common in the Rif and Atlas mountains of Morocco. Artist note: Artist note: I was deployed with the USAF at the Spanish Base Aero de Moron, near Seville. While on leave, my husband and I wandered around the Sierra Nevada south of Granada in the area made famous by the book “Driving over Lemons”. W/C The Fair (Feria) every April in Seville, Spain in the heart of Andalusia is an incredible time. There is an equestrian parade of beautiful horses and carriages to mark the beginning of the fair. 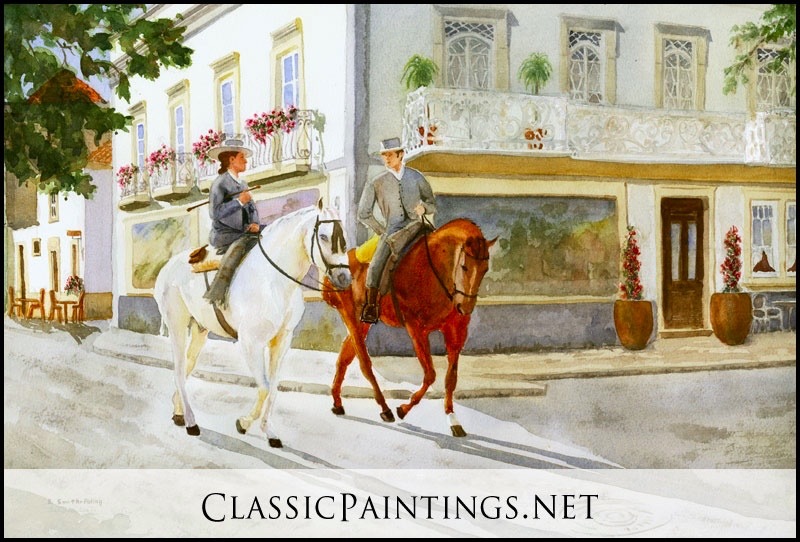 I just couldn’t resist painting the elegant horses and riders. Artist note: I was deployed with the USAF near here and had the luxury of frequently visiting this delightful town and making numerous sketches and paintings. W/C Seville, Spain in the heart of Andalusia is renown for its Spanish dancers. 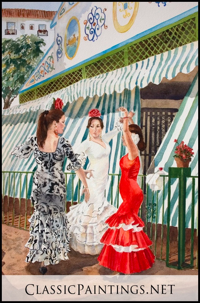 I immensely enjoyed a delightful evening watching the dancers while sipping a sangria at the Fair (Feria) every April in Seville. The beautiful dresses and their stunning form just begged to be painted. W/C The Fair (Feria) every April in Seville, Spain in the heart of Andalusia is an incredible time. 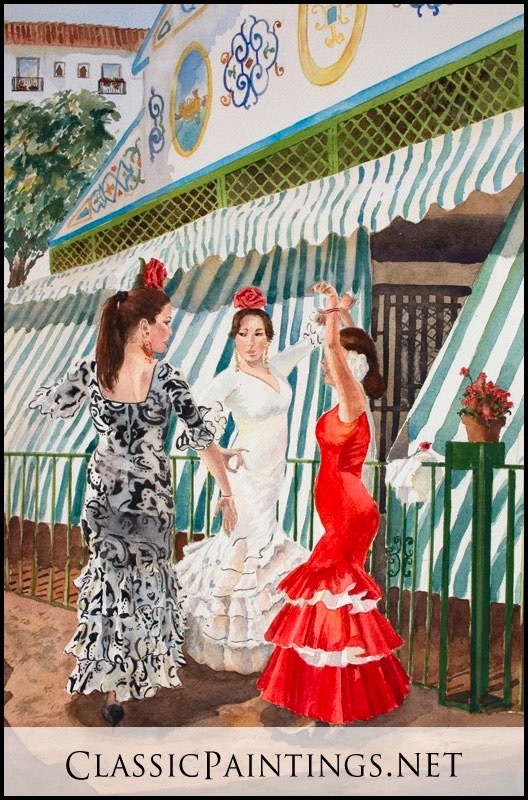 Seville is renown for its Spanish dancers and here at the fair were hundreds of women in beautiful dresses spontaneously dancing. I tried to capture some of this feeling in their spontaneous dance. 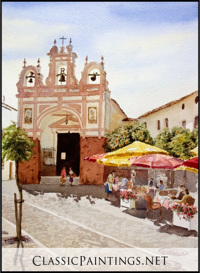 W/C Artist note: I was deployed with the USAF at the Spanish Base Aero de Moron, near Seville. While on leave, my husband and I wandered around the Sierra Nevada south of Granada in the area made famous by the book “Driving over Lemons”. We stayed in a very small village called Mecina Fontales. All the paths between houses are very narrow and that provides shade from the heat. Many of the “white” houses were accented with beautiful flower displays. For further history see below. * Description courtesy of the Orgiva, Spain website. 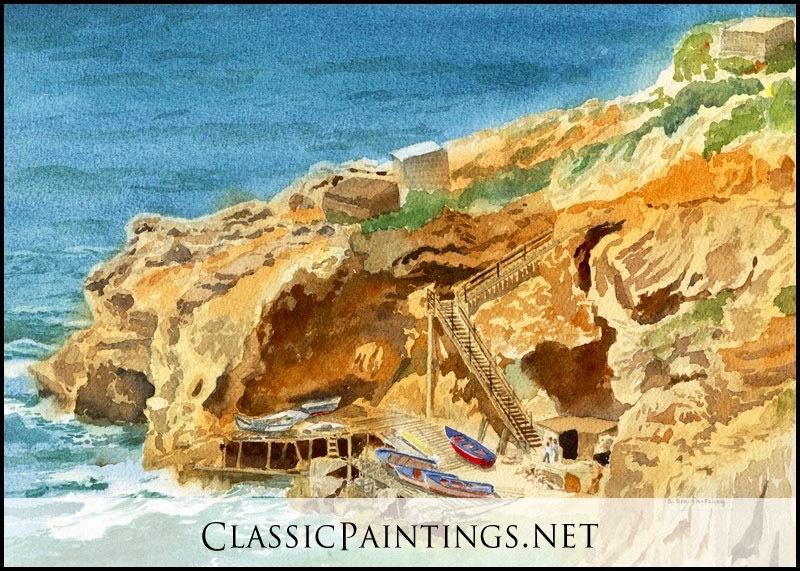 W/C This is a painting of a cave dwelling located on the beach at Nerja. It was quite stunning and fascinating to paint. 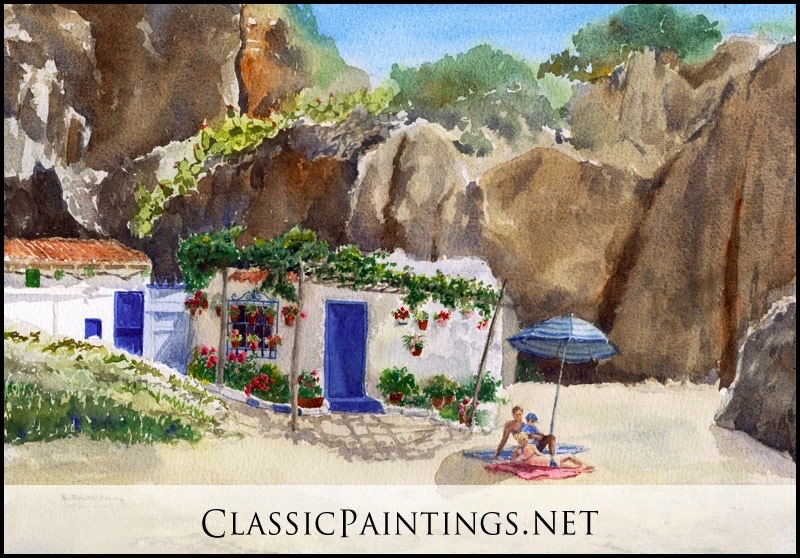 Nerja has a long history, evidenced by the primitive paintings found in its famous Nerja caves, discovered in 1959. These caves are now believed to be just one entrance to a linked series of potholes stretching many miles into the mountains between Nerja and Granada, and which may yet prove to be one of the most extensive unexplored systems in Europe. The Romans gave the settlement the name "Detunda", and it was later taken over by the Arabs. Under the Muslims, it became "Narixa", which means "abundant spring", and is the origin of its present name. The Balcón de Europa, a mirador or viewpoint which gives stunning views across the sea, is in the centre of the old town. Its name is popularly believed to have been coined by King Alfonso XII, who visited the area in 1885 following a disastrous earthquake and was captivated by the scene. Local folklore says that he stood upon the site where the Balcón now stands, and said "This is the balcony of Europe." Local archive documents are said to show that its name predated this visit, but this has not prevented the authorities from placing a life-sized (and much photographed) statue of the king standing by the railing. Artist note: I was deployed with the USAF at the Spanish Base aero de Moron,. 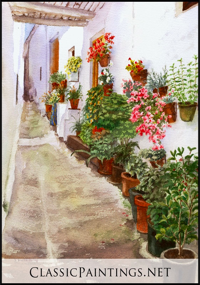 My husband and I had a delightful weekend at Balcón de Europa, where I made numerous sketches and paintings. The Barrio Santa Cruz was the medieval Jewish Quarter and now is a delightfully picturesque quarter with artisan shops, cafes, whitewashed architecture studded with flower pots and winding lanes. 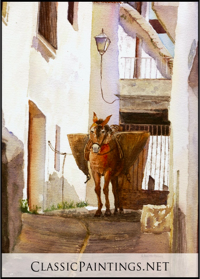 Artist note: I was deployed with the USAF near here and had the luxury of frequently visiting Seville and making numerous sketches and paintings. My husband, son and I had the fortune to be in Seville for Semana Santa (Easter holy week) and thoroughly enjoyed the pageantry of each church carrying their relics in parade. 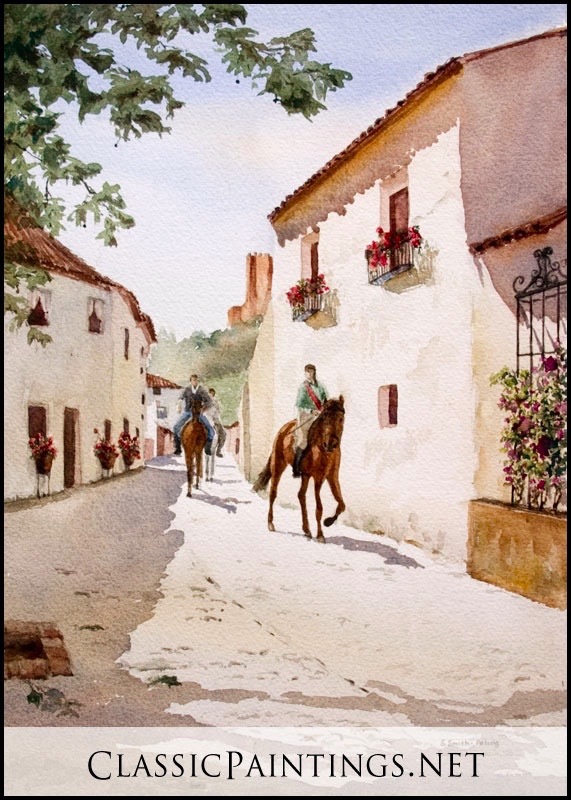 Artist note: I was deployed with the USAF at the Spanish Base aero de Moron, near here and had the luxury of frequently visiting this delightful area and making numerous sketches and paintings. 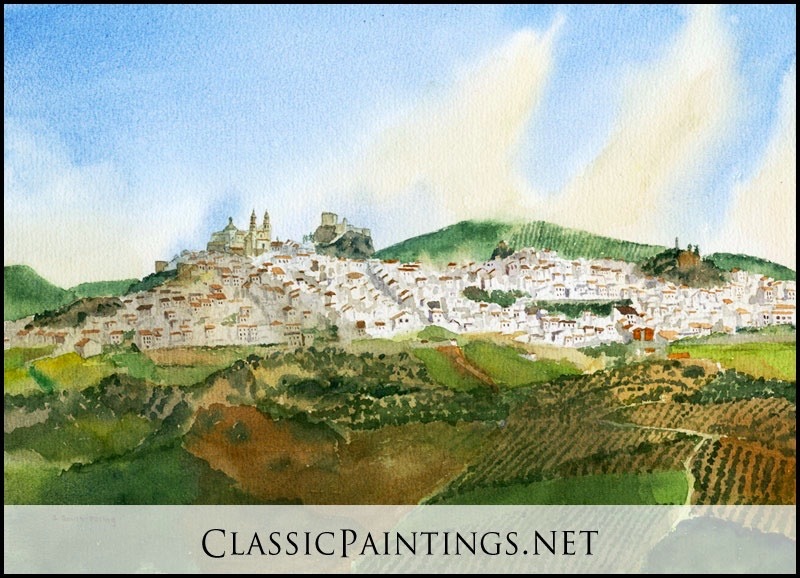 The olive orchards with the cloud shadows were intriquing to paint with the white village perched on the hill. W/C An intriguing fishing fleet: Every country has its unique fishing style and boats- Mallorca is no exception. 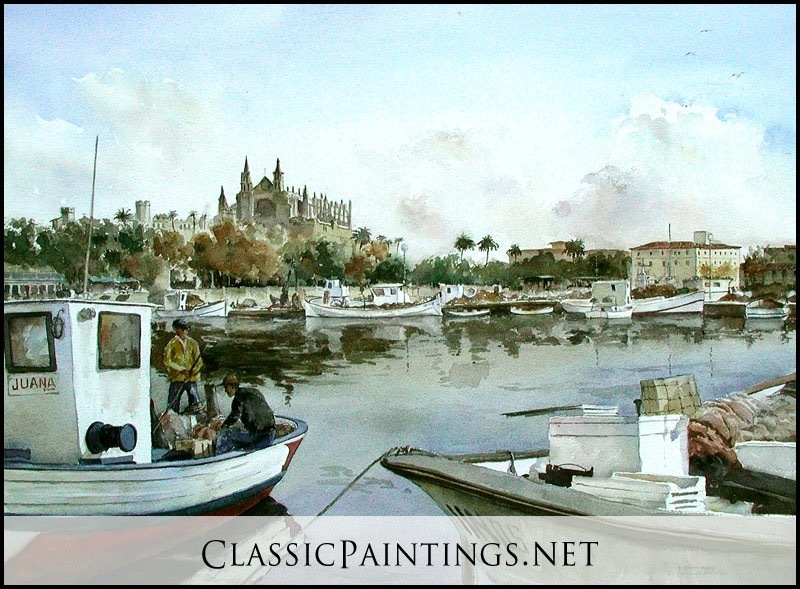 I enjoyed painting the harbor with the cathedral on the hill. Mallorca in the fall is delightful; all the millions of summer tourists have left. The beaches are pristine with water warm enough for an invigorating swim. This November, I painted while my children swam. W/C Seville, Spain. Plaza de España was laid out in 1929 for the Ibero-American Exposition and along with the adjoining Maria Luisa Park are among the most pleasant - and impressive - public spaces in Spain. I was fascinated by the architecture and the beautiful detail with the beautiful Spanish and Moorish influence in the tile decorations. W/C Spring in Andalusia, Spain is incredibly beautiful. 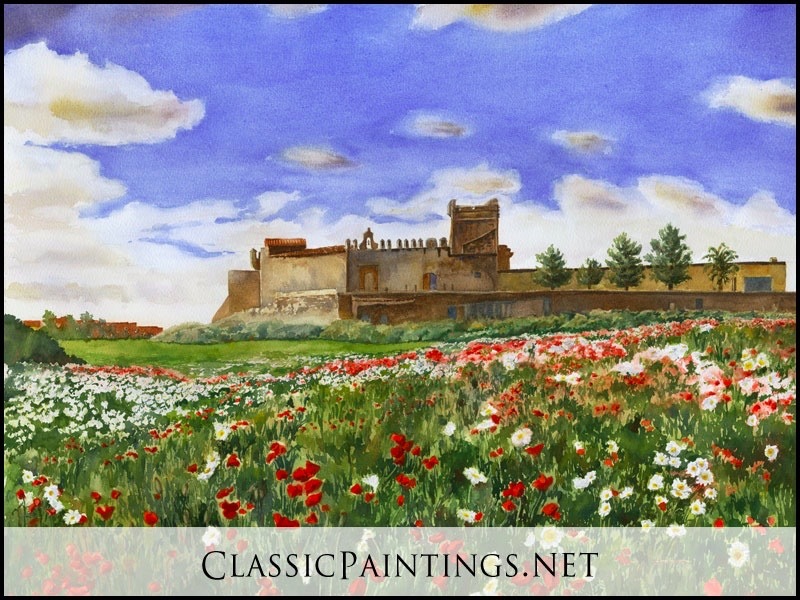 The red poppies and daisies in front of this castle just called out to me to be painted. 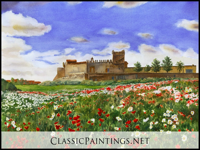 I passed this castle frequently when driving on route A-360 from Moron to Seville, Spain, but not until the wildflowers were out did it beg to be painted. Unfortunately, I never did find out the name of the castle. 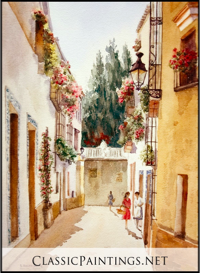 Rhonda, Spain is situated in the far northwest of the province of Malaga. It sits on an outcrop of rock surrounded by mountain ranges and is of a height and length that make access difficult. It is one of the oldest towns in Spain and has its origins in prehistory. The cave of Pileta has the Andalusian Stone Age art are located near here. This was the main access arch to enter the town in the 18th century under King Felipe V. The town has a strong Moorish influence in its architecture, Arab baths, etc. It is well known for its banditry (its location made it near impenetrable) and bullfighting. 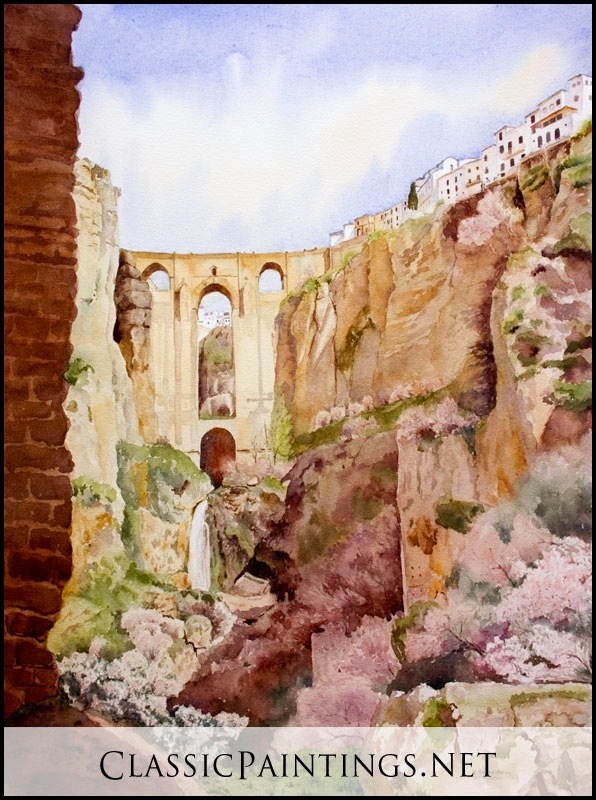 W/C Almond trees in full bloom gave a wonderful warm, pinkish glow to the Gorge and bridge at Ronda. It just begged to be painted! 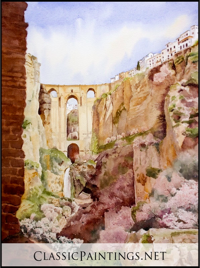 Ronda, Spain is situated in the far northwest of the province of Malaga. It sits on an outcrop of rock surrounded by mountain ranges and is of a height and length that make access difficult. 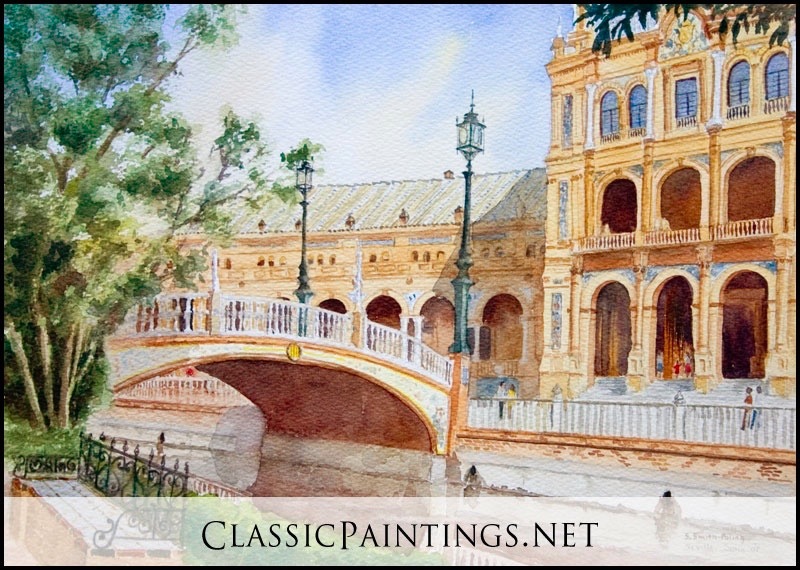 It has an incredible bridge that just inspires artists and dreamers including myself. Hemmingway is said to have had a house here. Picasso is said to have stayed and painted in a little cottage along the walk down from the bridge. It is one of the oldest towns in Spain and has its origins in prehistory. The cave of Pileta has the Andalusian Stone Age art are located near here. This was the main access arch to enter the town in the 18th century under King Felipe V. The town has a strong Moorish influence in its architecture, Arab baths, etc. It is well known for its banditry (its location made it near impenetrable) and bullfighting. W/C Ronda, Spain is situated in the far northwest of the province of Malaga. It sits on an outcrop of rock surrounded by mountain ranges and is of a height and length that make access difficult. It has an incredible bridge that just inspires artists and dreamers. Hemmingway is said to have had a house here. Picasso is said to have stayed and painted in a little cottage along the walk down from the bridge. It is one of the oldest towns in Spain and has its origins in prehistory. The cave of Pileta has the Andalusian Stone Age art are located near here. 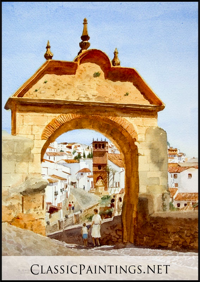 This was the main access arch to enter the town in the 18th century under King Felipe V. The town has a strong Moorish influence in its architecture, Arab baths, etc. It is well known for its banditry (its location made it near impenetrable) and bullfighting. W/C Named after its once flourishing wineries - bodegas - Setenil is probably unique among the pueblos blancos, white villages, of Andalucia. 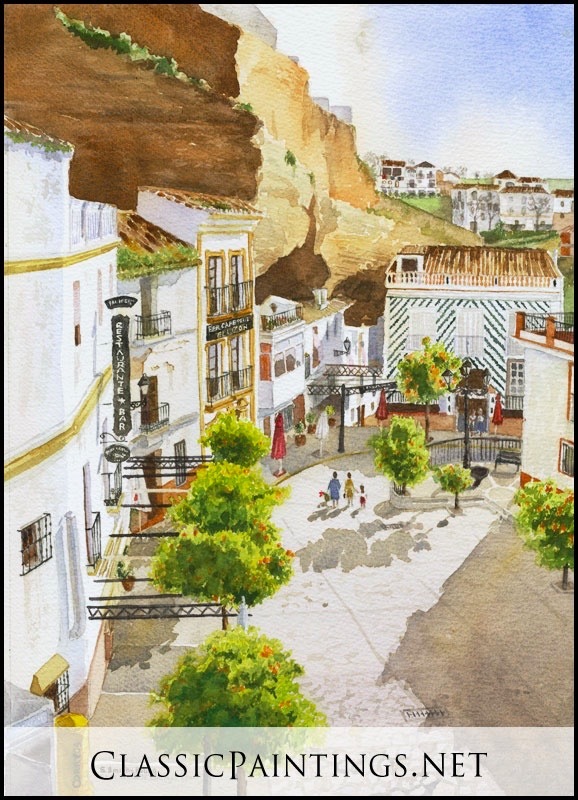 Where most pueblos blancos were built on protective bluffs and pinnacles, this town grew out of a network of caves in the cliffs above the rio Trejo north-west of Ronda. Its blinding white houses seem to emerge from the rocks, and some have rock roofs and even olive groves on their roofs. There has been a human settlement here since at least the Arabic Almohad period in the twelfth century. Given the evidence of other nearby cave-dwelling societies, such as those at the Cueva de la Pileta west of Ronda, where habitation has been tracked back more than 25,000 years, it is possible that Setenil was occupied much earlier. Most evidence of this would have been erased in its continued habitation. It was certainly occupied during the Roman invasion of the region in the first century AD. Modern Setenil begins in 1484, relatively late in the Christian Reconquest, when the Christian armies expelled its Moorish, Granada-led Nasrid rulers. It took the Christians fifteen days to expel the Moors from the (nowadays ruined) castillo, castle, at the top of the town. The town name is believed to have been taken from the Roman Latin phrase "septem nihil", "seven times no", a phrase possibly linked to earlier invasions or skirmishes. The full moniker Setenil de las Bodegas dates from the 15th century, when its new, Christian, rulers developed an agricultural base of olives, almonds and vineyards. The first two still flourish on the hills and rooftops of Setenil, but its wine trade was wiped out by the phylloxera insect infestation of the 1860s, which effectively destroyed most European vine stocks. W/C Spring in Andalusia is alive with poppies. Along the road to Moron de la Frontera was this Hacienda with the beautiful fields. 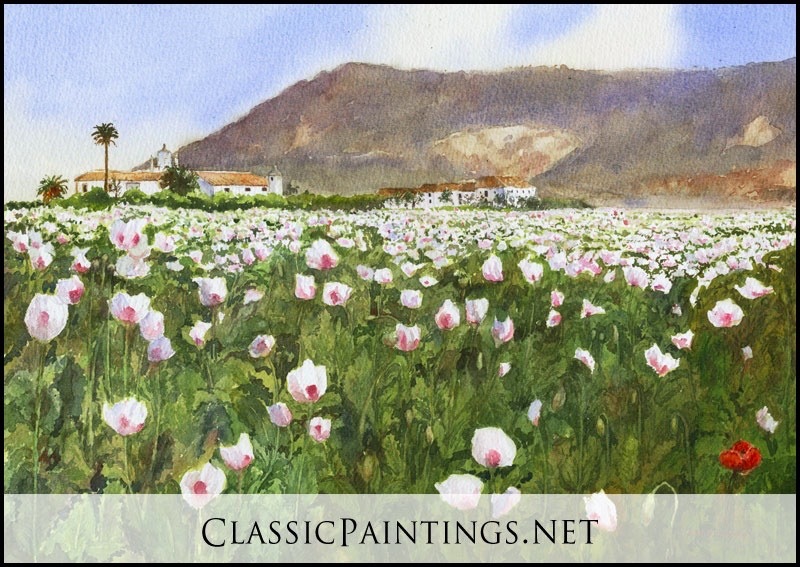 Of course there was the stray wild red poppy to add character to the scene! Artist note: I was deployed with the USAF near here and had the luxury of frequently visiting this delightful area and making numerous sketches and paintings. W/C Marchena in Andalusia, Spain is a beautiful town. 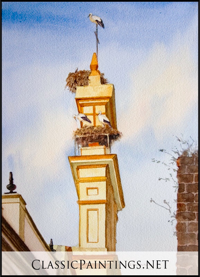 All the tall buildings have stork nests each spring and it is fun to sit at the cafes and watch the storks. I just had to paint them. 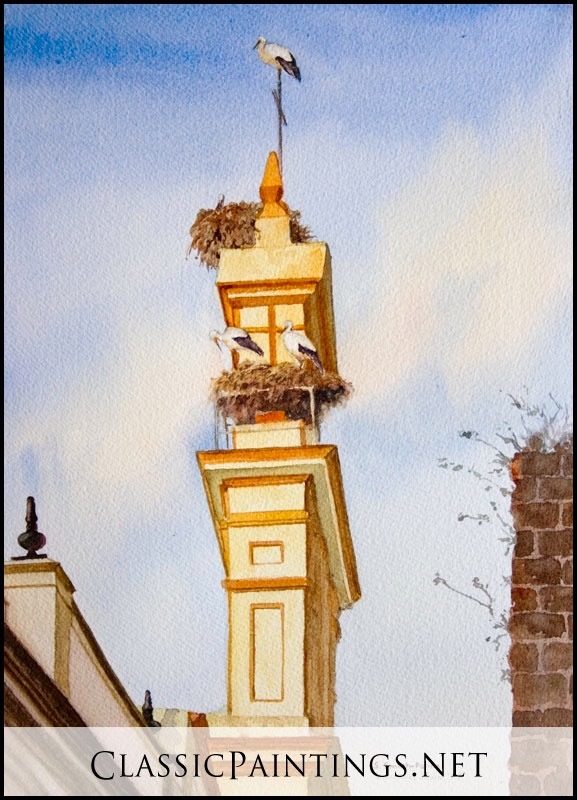 You see nests in most of the villages especially in the bell towers and churches. W/C On the road to Ronda, Spain just south of Coronel is the old Castillo de las Aguzaderas. 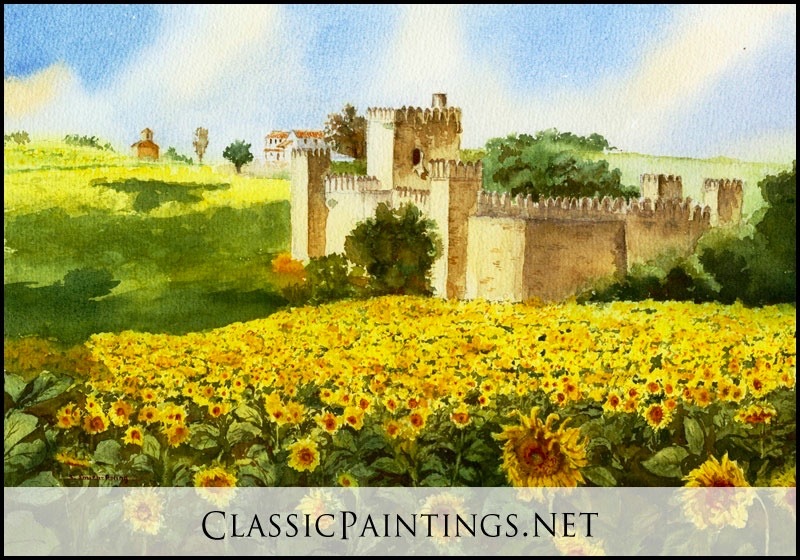 I often thought of painting it and then in June there was a splendid field of sunflowers surrounding it. I just had to paint it. 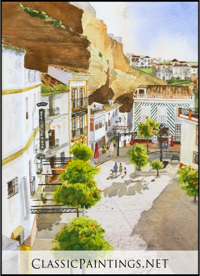 Artist note: Artist note: I was deployed with the USAF at the Spanish Base aero de Moron, near here and had the luxury of frequently visiting this delightful area and making numerous sketches and paintings. W/C Zaharra de la Sierra or de los Membrillos (of the Quinces) is a perfect example of a fortified hill town. It is set in beautiful country, high on a steep hill, entirely white with red-tiled roofs and descending down the side of the hill. It is huddle around a church and a castle on a stark outcrop of rock. Once it was an important Moorish town, but was captured by the Christians in 1483. I spent many delightful evenings at the cafes in this village enjoying the clear atmosphere, fine Tapas, architecture and conversations. Artist note: I was deployed with the USAF near here and had the luxury of frequently visiting this delightful town and making numerous sketches and paintings.